This article is about the baseball player. For other people named Bob or Robert Kennedy, see Bob Kennedy (disambiguation). Robert Daniel Kennedy (August 18, 1920 – April 7, 2005) was a right fielder/third baseman, manager and executive in Major League Baseball. From 1939 to 1957, Kennedy played for the Chicago White Sox (1939–42, 1946–48, 1955–56, 1957), Cleveland Indians (1948–54), Baltimore Orioles (1954–55), Detroit Tigers (1956) and Brooklyn Dodgers (1957). He batted and threw right-handed. After his playing career, Kennedy managed the Chicago Cubs (1963–65) and Oakland Athletics (1968). His son, former major league catcher Terry Kennedy, was a four-time All-Star and minor league manager. Kennedy was born in Chicago. A line-drive hitter, he was blessed with a strong and accurate throwing arm. On June 22, 1937, the night before the White Sox signed him, Kennedy was working as a 16-year-old popcorn vendor at Comiskey Park during the World Heavyweight Boxing Title between Joe Louis and James J. Braddock. Kennedy debuted a year later, and became the starting third baseman in 1940. In 1940, he became the first teenaged major leaguer since 1900 to play 150 games in a season. After a break of three years to serve in the military during World War II, he returned, to play mostly in right field. 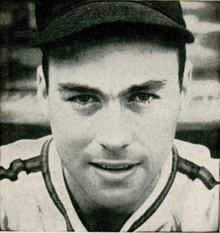 In the 1948 midseason Kennedy was sent to Cleveland in the same trade that brought Pat Seerey to Chicago. Kennedy hit .301 the rest of the year and became a member of the last World Championship Indians team. His most productive season came in 1950, when he posted career-highs in batting average (.291), runs (79), hits (157) and doubles (27). The same season, he started two triple plays from the right field, matching Indians left fielder Charlie Jamieson's two triple plays of 1928. Kennedy was traded to the newly relocated Baltimore Orioles in 1954. On July 30, he belted the first grand slam for Baltimore against Yankees pitcher Allie Reynolds. In 1955, Kennedy was purchased by the White Sox and sent to Detroit in 1956. Released in April 1957, he signed as a free agent with the White Sox, for his third stint with the club. A month later, he was selected off waivers by the Brooklyn Dodgers, being released at the end of the season. Following his retirement, he was a scout and farm system director for the Indians, and manager of the Triple-A Salt Lake City Bees. In 1962, Kennedy was named to the Cubs' College of Coaches and designated as "head coach" for an indefinite period. The Cubs had experimented with having a committee of coaches run the team on the field since 1961. After the 1963 Cubs posted their first winning record in 17 years, Kennedy began to assert a more traditional managerial authority over the team. He served as head coach from 1963 until June 13, 1965, posting a 162–198 record. He served as special assistant to Cub general manager John Holland, manager of the Los Angeles Dodgers' Double-A Albuquerque affiliate, and a coach with the Atlanta Braves until 1968. In 1968, when the Athletics moved from Kansas City to Oakland, Kennedy was their first manager. Oakland finished sixth in a 10-team league with an 82–80 record, a notable improvement from the 62–99 last-place 1967 Athletics. It was also the franchise's first winning season since 1952, when the team was still in Philadelphia. According to the 1972 book Mustache Gang, authored by Ron Bergman, on the last day of the season Kennedy walked into Charlie Finley's office, expecting an extension. Five minutes later, Kennedy had been fired. After that, he spent six years (1970–75) as director of player development and director of player personnel of the St. Louis Cardinals, and 1976 as a member of the Seattle Mariners' start-up baseball operations team preparing for the club's 1977 debut in Major League Baseball. Kennedy then returned to Chicago for 4½ seasons, beginning in 1977, as the Cubs' general manager. He was released from the position in May 1981. Rounding out his baseball career, Kennedy then served as a senior baseball operations executive for the Houston Astros (1982–85) and San Francisco Giants (1986–92), assisting his former Cleveland teammate Al Rosen, then the president or general manager of those teams. In a 16-season playing career, Kennedy was a .254 hitter with 63 home runs and 514 RBI in 1,483 games. As a manager, he posted a 264–278 record in two-plus seasons. Bob Kennedy died in Mesa, Arizona, at age of 84. ↑ The Sports Encyclopedia: Baseball, 6th Edition, 1984. ↑ Shea, John (10 April 2005). "The rundown". San Francisco Chronicle. Retrieved 21 December 2010.